Disincarnates, Oh How They Drain Us! Ask any medium or ghost hunter and they will tell you that disincarnates are a mixed bag of varying degrees of trouble. It may be fun and a cool feature of your home or store to have a ghost buddy hanging around but it could be the source of your oddball problems too. Just because they’re dead doesn’t mean they’ve got any more sense than when they were alive. Dead folk have needs too and could be desperate enough to ignore good manners and boundaries. I find that ghosties for the most part are benign. A ghost only becomes a problem, when they have a problem and if you’re not ready for it, you could come to regret being the haunted home or store on the block. Then there is the “newbie”. We all know people who are just becoming aware of the touchy world of spirit and all that means. These people are our customers and our friends and they are in our store for validation and probably help. If you or our customer begin their story with “you’re not going to believe this….” start heading over to the candle section. Being sensitive to the spirit world is, in a word, challenging. Until you get full understanding and control on your gifts, being around disincarnates can be a burden and leave you feeling like you are constantly “coming down with something”. Here’s why. They can shift in energy from happy to gloomy, mess with electricity, create cold spots in the room, clever ones know how to move objects and make noise, and finally they can push random thoughts and emotions through you. Common reactions are feeling nasty spikes of pain in your head, a cramp in your stomach, the hair stand up on the back of your neck, feeling watched, being touched ever so lightly or being pushed and feeling dizzy, faint or light headed. Though usually not all at once and to varying degrees. It really depends on the vibration of the ghost and whether or not it’s draining energy off. Yes they drain off your energy and the more unstable you are emotionally, the easier it is for mischievous ghosts to grab it. Ghosts have been known to frighten us or start fights between us just to get us to expel some energy. Don’t feel bad if you’ve fallen for this trick. It’s our nature to react to situations, especially ones that we are blindsided by. If we didn’t we may not be here to tell ghost stories. If your ghost is like this, it’s time to say good bye. Saying good-bye can often become a ritual for uplifting the poor soul, but that is completely up to you and your comfort zone. An unhappy, angry or otherwise mean ghost with an agenda is wounded and its wounds keep it attached to the earthly plane as it looks for resolution or revenge. Sometimes they stick around because they are unclear about where to go now that they are dead, other times they want to accomplish something before they go. Finally, there are ghosts who just plane love it here and they love to mess with us. I’m sure there are as many reasons for a haunting as there are disincarnates. Then there is a haunting that is not actually a ghost or disincarnate. They are left over emotions, strong emotions that take up space and change the vibration of the room. They are much easier to deal with than a ghost because they don’t have any consciousness or agenda. They are a puff of smoke. If you come across a haunting that is kinda unresponsive, you may have found emotional pollution. You can dismiss this energy with prayers, smudge or the assistance of a spirit guide and a good laugh and replace that dense darker energy with light happy energy. There are several ways to clear a ghost from your premises, and if one way doesn’t work, try another. 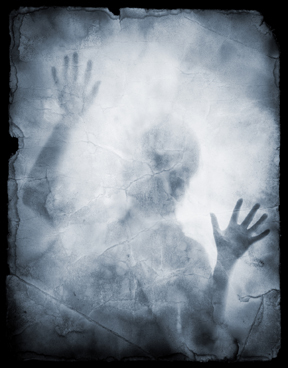 Some methods banish the ghost from your space and lock it out energetically, but that doesn’t necessarily help the ghost. This ghost was a person at one time and still needs love, compassion and guidance and maybe now more than ever. Lighting a candle for them is a very touching way to communicate that you are willing to help them out. The Grief Affirmation candle, and the Peace World candle are both perfect for this. I am very much inclined to recommend a ghost whisper who will help elevate the soul instead of banish it. If there is no one available, go straight to spirit. This is a spiritual problem after all. If you don’t already have high level spirit guides you work with call upon Archangel Michael. This archangel is looking after humanity all the time. He is our champion and faithful to our evolution and will come to our aid whether we have a physical body or not. Next pray for the ghost, and release him or her from its obligations to the earth and the life it has just completed and return to heaven so he or she can figure out what is next on its soul’s journey. Look in the bible or other books of prayer for an upliftment prayer. Marianne Williamson’s Illuminata is a wonderful resource. After the disincarnate has crossed over completely, let them go by not discussing the event or speaking their name for at least three days. I know it was an exciting experience, but you can call the ghost back by telling the story over and over again. Let the door close all the way. Now is a good time to fill your space with joy and your own energy. Go ahead and light a Happy Home, Peace and Serenity Blessed Herbal Candle or a Sweet Grass World candle to celebrate. If it feels necessary, also light a Protection Blessed Herbal Candle or Hekate World Candle. GHOST CANDLES ARE HERE FOR ONLY A LIMITED TIME...ONCE THEY'RE GONE THEY'RE GONE!